In this Part we will explore the meaning of the Seventh Shloka of Sri Vishnu Sahasranamam. The Lord is beyond the grasp of others and cannot be reached by the normal senses. He is eternal and is in a permanent state of bliss for whom Creation is a Sport. His eyes are Red like the Lotus flower. He is the annihilator of the Universe and subsumes the world within Him at the time of Deluge or Pralaya. He is affluent and well-endowed with Greatness. He is the one who is the protector in all three States of Consciousness, the one who is Pure and Supremely auspicious. Agraahyah means ‘He who cannot be grasped’ by the organs of action as Sri Adi Sankara says ‘Karmendriyaihi na grihyate iti Agraahyah. Taitriya Upanishad says ‘Yato Vaacho nivartante apraapya manasaa sah – He cannot be described through speech, and cannot be conceived by the mind’. Swami ChinmayAnanda gives us another interpretation. He points out that the Lord is not the ‘object’ of perception ever by any one, but He is the ‘subject’ who perceives. Thus He is ever the Subject but never the object of perception. He is imperceptible and incomprehensible. He refers us to the Kena Upanishad’s passage ‘Yat chakshushaa na pashyati yena chakshoomsi pashyanti tadeva brahma tvam viddhi’ – Understand that Brahman is That which cannot be seen by the eyes, but because of which the eyes are perceiving other things. Shaasvatah means someone who is perennial and everlasting. In the words of Sri Adi Sankara ‘Shashvat sarveshu kaaleshu bhavati iti Shaashvatah – He exists at all times’. Meaning: He is the protector of the Universe and the Ruler of the individual souls; He who is permanent and supremely auspicious and unchanging. He is the in-dwelling spirit who is supremely worthy of being known, who is the embodiment of the Universe and who is the Supreme goal. Swami ChinmayAnanda points out that for something to be permanent, it has to be changeless over Time, and Bhagavan is the controller of time, and is not controlled or affected by time, and so He is eternal and permanent. According to Sri Adi Sankara, ‘Krish’ stands for existence or Sat and ‘Na’ stands for bliss or Ananda. So Krishna denotes a Sachidaananda Svaroopi or someone permanently in a state of Bliss. Sri Parasara Bhattar interprets ‘Krishi’ as a receptacle or container or ground (Bhu or Bhumi i.e. land) and ‘Na’ stands for bliss. 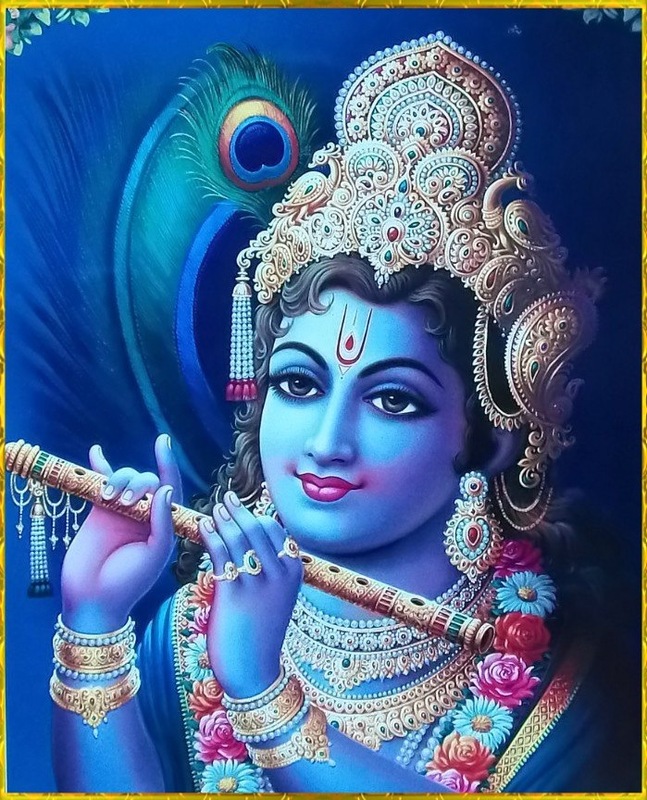 So Krishna means receptacle of joy because of His constant engagement in the Sport of Creation. Meaning: Through his many tricks of Maya He created the world of pleasure and pain, heaven and hell and the countless souls. All this is His Cosmic Leela or sport, so I end my despair and praise Him. One who has a dark-blue complexion. 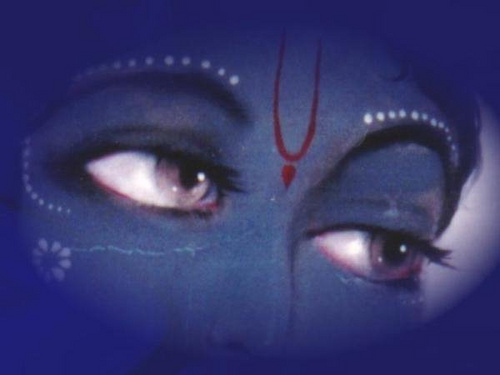 The word ‘Krishna’ literally means dark colour. We have seen in the Dhyana shlokas the Lord is described as ‘Megha Shyaamam or Megha Varnam or Ambuda Shyaamam – dark blue like the rain-bearing cloud’. Andal in her Thiruppavai in her first Pasuram describes the Lord as ‘Kaar Meni Sengan Kadhir Madhiyam pol Mugathaan’ – One who is with a dark cloud-like complexion, Lotus red eyed and lustrous face shining like the Sun and calm like the Moon. The Nama ‘Krishna’ can also be interpreted as ‘Akarshana’ or someone with magnetic attraction! Lohita means Red and Aksha means eye and so Lohitakshah means somebody whose eyes are Red as in Lotus flower. As Sri Adi Shankara puts it ‘Lohite Akshinee yasya iti Lohitaakshah – One whose eyes are Red’. Sri Parasara Bhattar attributes two meanings, one where his eyes are red as a result of extreme joy and another as a result of His anger towards evil-doers. Earlier in Shloka 5 we have already seen the name ‘Pushkaraakshah’ with similar meaning. Basically this term means ‘The Destroyer’. This Nama is derived from the root word ‘tardih’ – to cause destruction. Pra-tarda means total destruction. Sri Bhattar gives the following from Katha Upanishad – ‘yasya brahma cha kshatram cha ubhe bhavatah odanah’ – He who has for His food the Brahmins and the Kshatriyas (i.e., all beings of the Universe) at the time of the great Deluge (Pralaya). Sri Radhakrishna Shastri points out that given the interpretation for this Nama, the redness of the eye in the previous Nama can be appropriately construed as arising as a result of His anger at the time of dissolution. One who is affluent, ever-full, and well-endowed with wisdom, greatness, and other qualities. Literally this means ‘born full or perfect’ or a ‘Super-Being’. Sri Adi Sankara says ‘Gnanaa Aishvaryaadibhih Gunaihi Sampannah Prabhootah – One enriched with divine attributes such as Wisdom and Godliness’. He is well endowed with Gnana, Aishvarya, Bala, Veerya, Shakti and Tejas i.e, the Shat-Gunas, all intact even at the time of dissolution of the Universe. There are three words in this name – tri, kakub or kakut, and dhaama, Viz. dhaama means abode or residence, and also a ray of light or brilliance. Several interpretations arise depending on which of the meanings one picks. Sri Adi Sankara gives the interpretation that He is the base or support for the three regions of the entire space, the upper, the lower, and the middle, and therefore He is tri-kakub-dhaama. Swami ChinmayAnanda gives the Vedantic interpretation that He is the base or support for the three states of consciousness, viz., the jaagrat, svapna, and sushupti (the awaker, the dreamer and the sleeper) and this is why He is called tri-kakub-dhaama. Sri Bhattar gives the interpretation that tri-kakub-dhaama means One who has His abode as the Parama-Pada, which is thrice as large as this Universe. Sri Bhattar also gives an alternative possibility of taking Trikakut and Dhaama as 2 different words. Dhaama will be a separate Nama meaning the effulgent one. But this interpretation is offered only as a possibility. Pavitram means Absolute Purity. 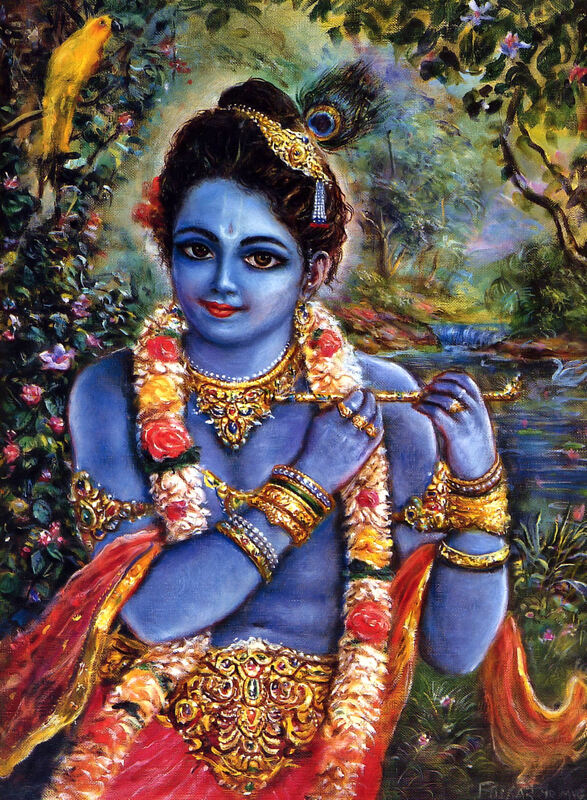 He is both Pure and makes His devotees Pure. The purity referred to here is the inner purity of the mind which He has and which He gives to those who meditate on Him. That is why the famous saying goes ‘Govindeti sadaa Snaanam, Govindeti Sadaa Japam – The mere mention of Govinda purifies like a bath. The mere thought of Govinda is like a sustained meditation’. Both Sri Radhaakrshna Shastri and Swami ChinmayAnanda offer a second and more uncommon interpretation – One who gives protection (traayate) from the thunderbolt of Indra (pavi). 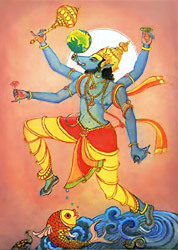 Swami ChinmayAnanda points out that in Vedanta, Indra refers to the mind (Indriyanam raja Indrah – the mind), and the thunderbolt of mind can destroy all the accomplishments of a Sadhaka, and only uninterrupted meditation of Sri Vishnu can give the protection against such distractions, and thus Vishnu is Pavi-tra. On the last night of the war, after Duryodhana’s defeat, a very disturbed and restless Ashwatthama was sitting sleepless under a large tree. An Owl ambushing a group of Crows caught his attention. This gave him an idea of attacking the Pandavas’ camp at night. He gathered the other surviving Kaurava warriors—Kritavarma and Kripacharya and attacked the Pandava camp. He strangled Dhrishtadyumna to death in his sleep, beating and thrashing the semi-conscious warrior. He moved on and killed Shikhandi, Uttamaujas and many other prominent warriors of the Pandava army. Those who tried to flee from Ashwatthama’s wrath were hacked down by Kripacharyya and Kritavarma at the camp’s entrance. He killed Draupadi’s five sons, the Upapandavas, while they were sleeping, believing them to be the five Pandava brothers. Ashwatthama, realising his mistake, went to Sage Veda Vyasa’s ashram in order to seek salvation (prayaschittam) for his crime. On seeing the two powerful Astras heading for a head on cataclysmic (catastrophic) collision that would result in the annihilation of the entire Earth, Sage Vyasa used his Yogic powers to stop the divine weapons from colliding with each other. He asked both these warriors to withdraw their respective weapons. Arjuna was able to withdraw his Brahma Astra, while Ashwatthama could not do so as Dronocharya did not teach his son how to withdraw it. 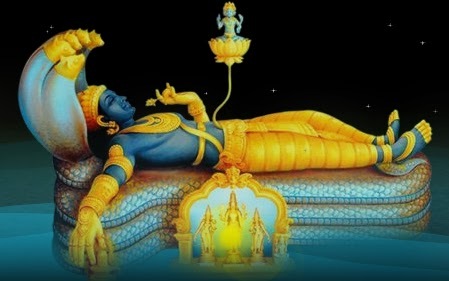 Ahswathama was given the option of deviating his weapon towards one single isolated object in a place that was not inhabited by any form of life, so that the Brahma Astra does not harm anyone on Earth. But Ashwatthama, out of spite, directed the weapon towards the womb of Uttara (wife of Abhimanyu) who was carrying Abhimanyu’s son (Parikshit) in an attempt to end the lineage of the Pandavas. 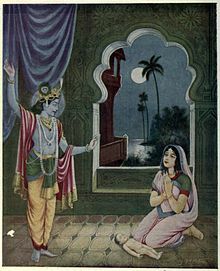 Thus by reviving Parikshit, Krishna demonstrates his purity. These are two words but to be counted as a single Nama ‘Ekam naama savisheshanam – Single name with a built-in adjective’. Param means superlative or of the highest order. Mangalam means auspiciousness. Meaning: Brahman is known as beneficence because He wards off all evils and brings on a series of benefits to men on being merely remembered by them. Param just emphasises that He is the Supreme in bestowing good results. Periazhvar has composed the ‘Thiru Pallandu’ extolling the Lord for his eternal existence. The Lord is beyond the grasp of others, hence He is Agraahyah. He is eternal and hence Shaasvatah. 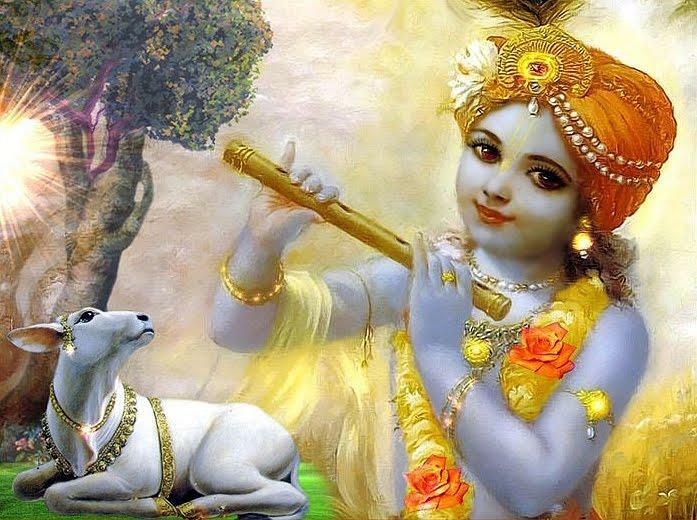 He is in a permanent state of bliss for whom Creation is a Sport, he is called Krishna. He is Lotus red eyed and hence known as Lohitaakshah. He is the annihilator of the Universe at the time of Pralaya and hence is Pratardanah. He is affluent and well endowed with greatness and so He is called Prabhootah. He supports the three States of Consciousness and hence known as Trikakubdhaama. He is Pure and hence Pavitram and He is Supremely Auspicious, hence He is Mangalam Param. The Vishnu Sahasranamam series is authored with help of my friend Shri Balaji. Thank you for this lovely site!! I have been searching everywhere for good translations, and this is the only one I have found that compiles so many sources and meanings together. Just wondering, what happened to the rest of the slokas (past 89)? Thank you Nitya! The commentary on the rest of the Shlokas are work in progress. I strive to release commentary on one Shloka every 1 to 2 weeks. This journey commenced about 3 years ago and I am hoping to complete this before June 2017 with His Grace! All of these worlds that are created and destroyed collectively, form just a small portion of that Sri Vaikuntam. He is the embodiment of peace! He is eternal! He is prosperous! He is sentient and ever blissful!! !